How are we almost three months into this year already? Seriously?! Back when I lived in the Midwest and on the East coast, there was a saying. If March came in like a lion, it would go out like a lamb … meaning it’s still winter at the beginning of the month, but by the end of the month, it’s usually pretty mild and somewhat pleasant – maybe even spring-like depending on where you live! Even though I live in Phoenix now and I don’t have the harsh winter like many of you, I’m still looking forward to spring. I love watching everything become new again and even the desert has a certain beauty. One of my biggest struggles during the winter is wanting to eat all of that rich, fat-laden comfort food. Tell me that I’m not the only one! Warmer weather seems to make me more conscious about eating better – not to mention, the grocery stores and farmer’s market are full of great produce! 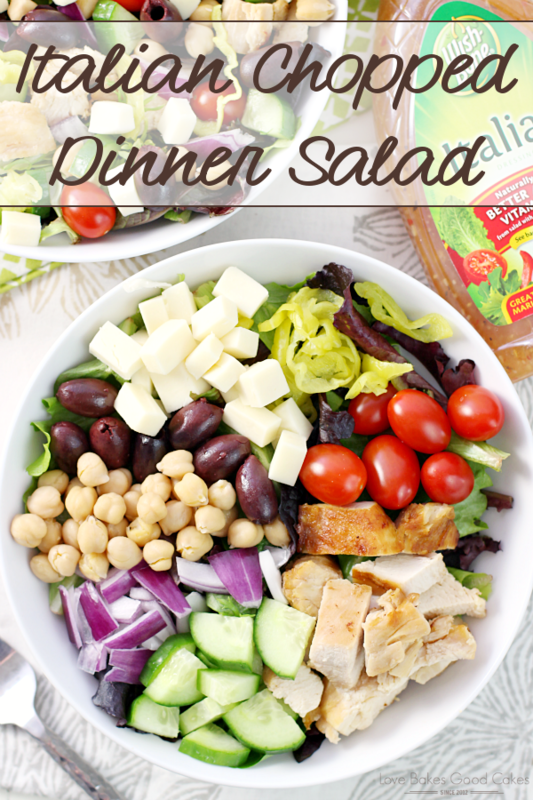 One of our favorite dinners lately is a nice chopped salad full of protein and fresh veggies. 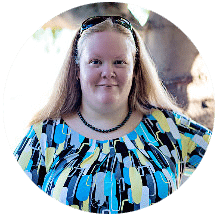 I love that the combination of ingredients is virtually endless – and even the “picky eaters” can take or leave the things they like or don’t like. 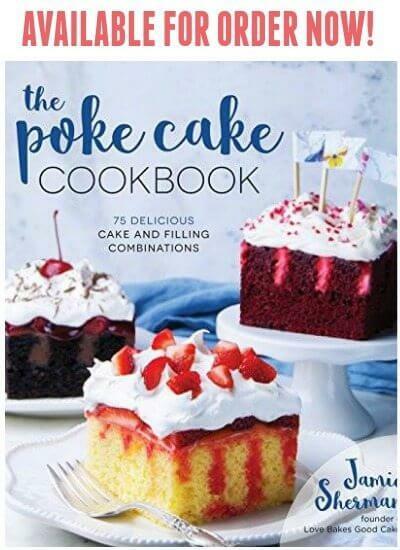 Really, we should eat salad more often in the Love Bakes Good Cakes house – it’s the perfect solution for the one kid who doesn’t like raw tomatoes on anything and the other kid who only wants to eat lettuce, chicken, and olives! 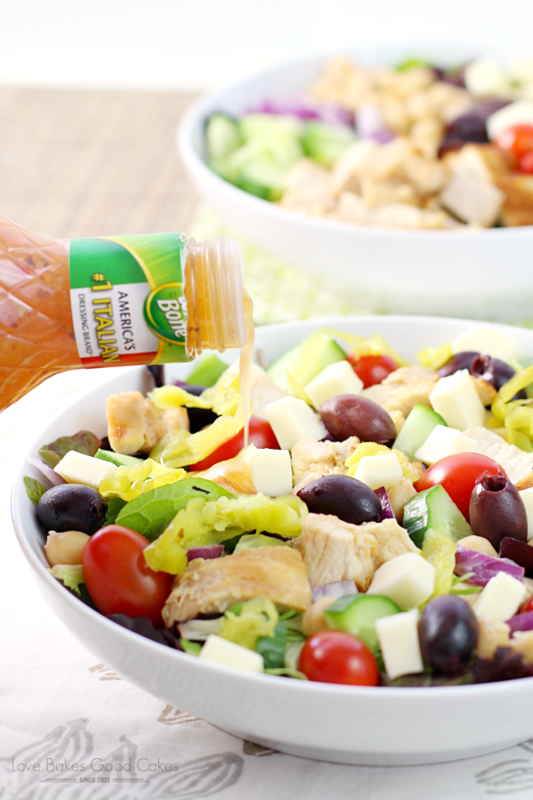 It’s time to mix things up – literally, with WISH-BONE® ITALIAN DRESSING and TYSON® GRILLED & READY® CHICKEN. 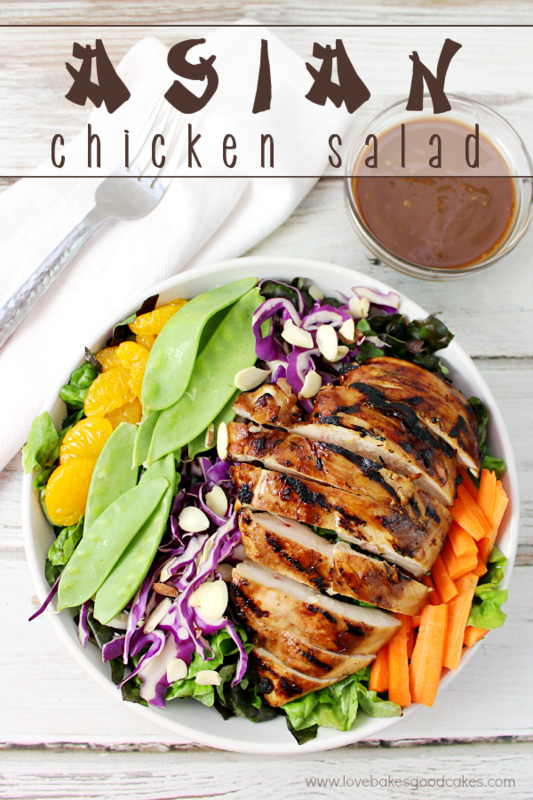 Tyson® Grilled & Ready® Chicken makes prepping this salad quick and easy! I microwave the chicken according to package directions then set it off to the side to cool off while I chop up the veggies for the salad. Once all of the veggies are cut, it’s just a matter of layering the ingredients in a bowl and topping it off Wish-Bone® Italian Dressing! With TYSON® GRILLED & READY® CHICKEN, you can have a protein filled meal that is good for you and your family – and it’s a delicious addition to any meal! 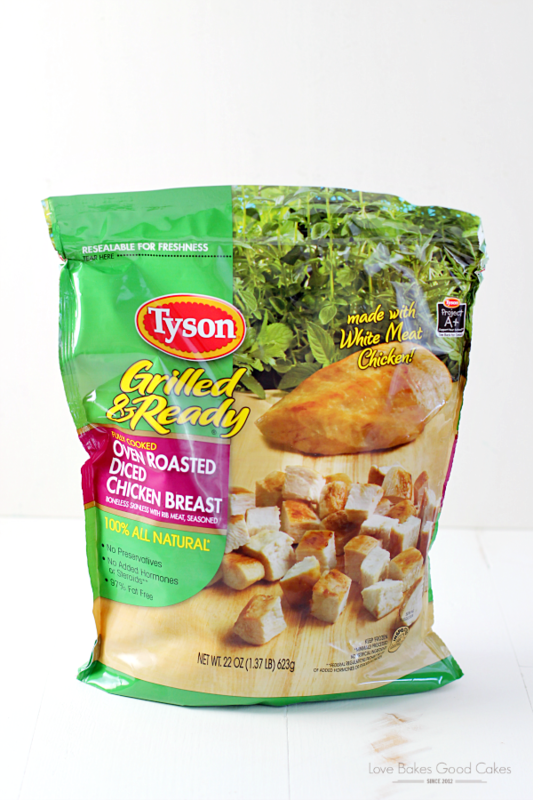 Keeping Tyson® Grilled & Ready® Chicken on hand is a simple and convenient solution that makes meal prep less hectic! 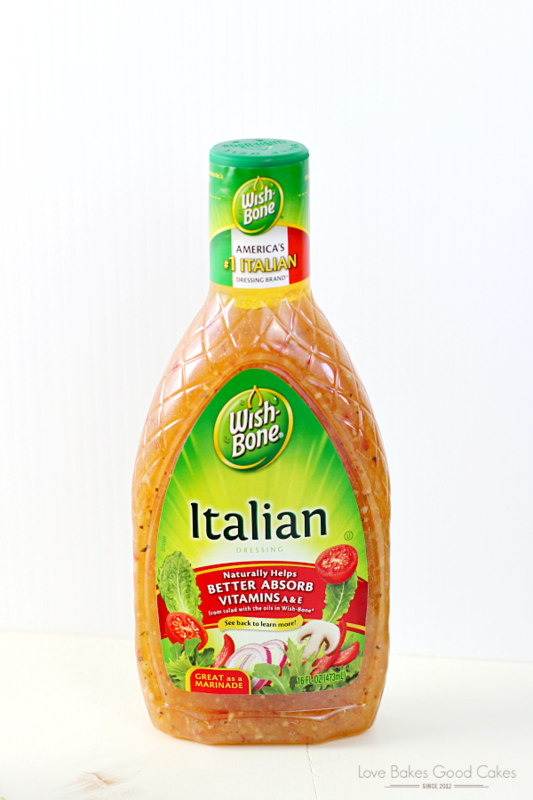 WISH-BONE® ITALIAN DRESSING delivers a robust and full-flavored dressing that is packed full of herbs, seasonings and flavors for an extra zesty boost of flavor – plus, it contains no high fructose corn syrup! With summer and warmer weather just around the corner, I know I will be stopping by Walmart to keep TYSON® GRILLED & READY® CHICKEN and WISH-BONE® ITALIAN DRESSING on hand to make mealtime quick, easy and delicious! 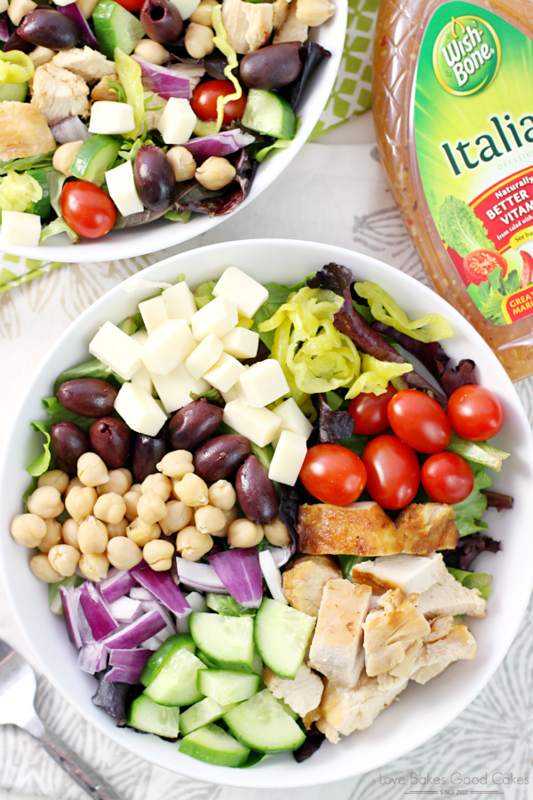 Chopped Italian Dinner Salad is a one bowl meal that’s perfectly balanced, stocked full of protein and bursting with flavor! You can have dinner ready in about 15 minutes or less! 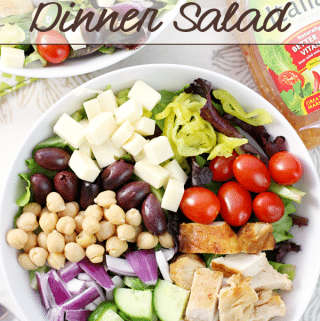 Divide the salad mix between 6 serving plates. Microwave the Tyson® Grilled & Ready® Chicken according to package directions and set aside to cool. Meanwhile, prep the veggies and cheese. To serve, layer the Tyson® Grilled & Ready® Chicken, garbanzo beans, tomatoes, cucumber, cheese, olives, onion, and peperoncini slices evenly between the plates. 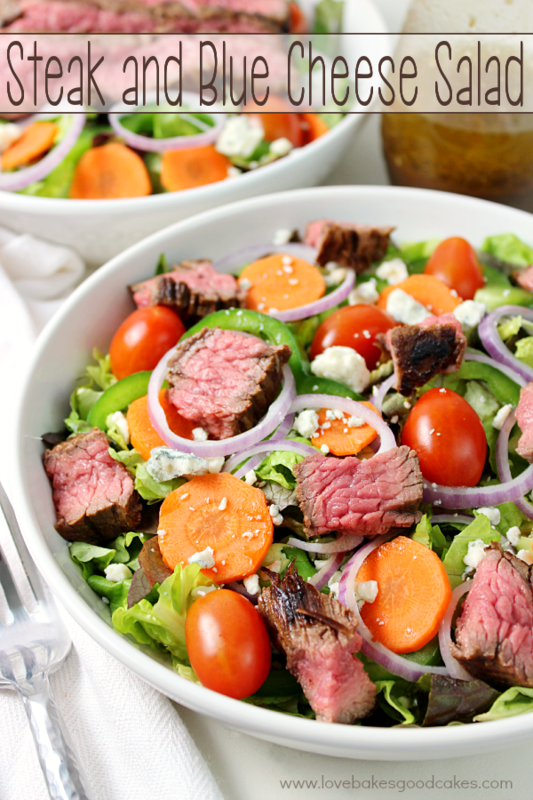 To serve, top each salad with Wish-Bone® Italian Dressing. 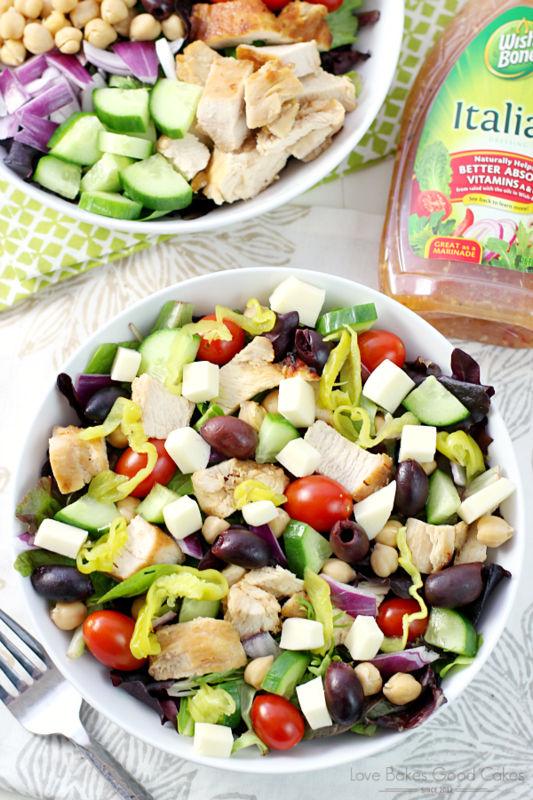 I’ve shared my family’s favorite Chopped Italian Dinner Salad with you. 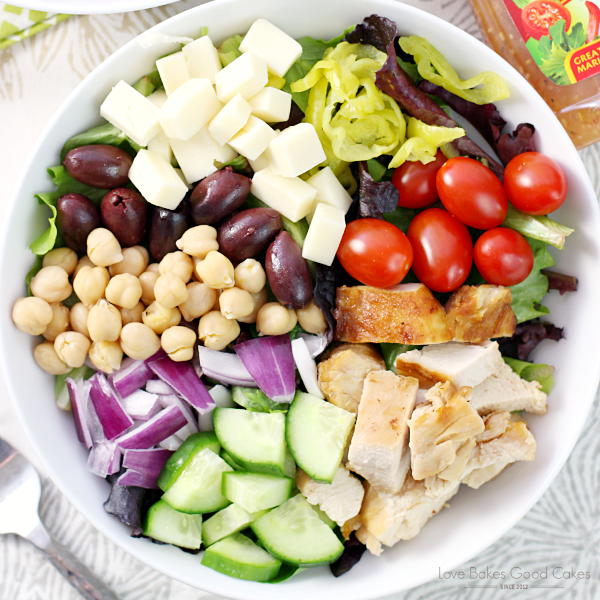 I would love to know what ingredients you love on your salad! Feel free to leave a comment letting me know! « 10 St. Patrick’s Day Recipes!